Ursula Handleigh. Untitled (068) (detail), 2014. 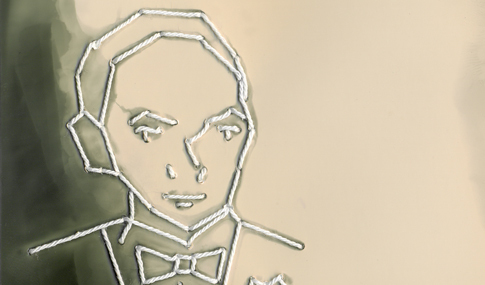 Silver gelatin paper, cotton thread. Between presence and absence, Palimpsest is an intervention of the familial archive. Working with thread and light, I am retracing the transitory moments of my ancestral past. Being the first generation in my family to be born in Canada, I have always felt detached from my family’s history. Growing up, I was surrounded by old family photographs and enveloped by the stories accompanied by them. The stories I heard about my parents and ancestors informed who I was and fill in the gaps of my own life’s story. These memories, created by others before me, became an extension of my own. Methodically retracing these remnants, I am creating my own ephemeral moment, physically binding myself to a familial history of which I was detached while simultaneously creating the kinship I longed for. This installation features almost 100 silver gelatin prints from the series Breathing into Empty Spaces which which were hand-sewn with cotton thread presented alongside an original work from her Journal series, and three large-scale reproductions of the artist’s original work within and outside the building. The works were produced between 2014-2016. Ursula Handleigh is a conceptual lens-based artist. Working with experimental photography, film and historical processes of image making, her practice explores questions of identity, perception, memory and familial relationships. Handleigh earned a BFA from OCAD University and is currently working towards a MFA from NSCAD University in Halifax. 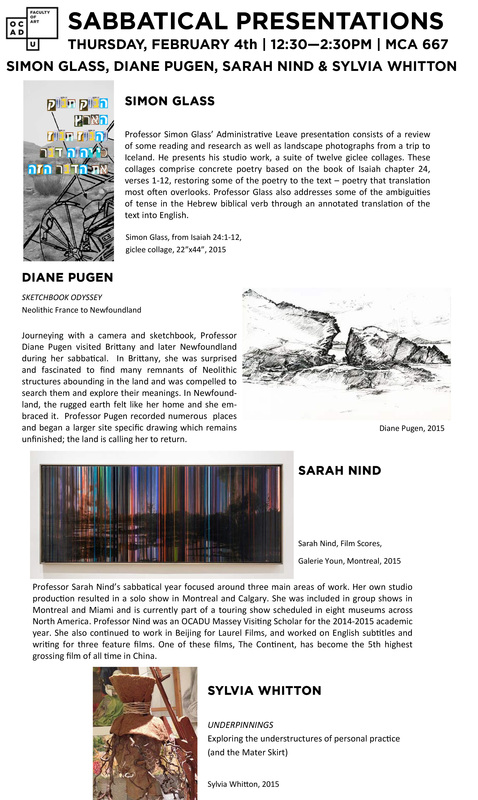 Her work has been exhibited across Canada, the US and Europe. 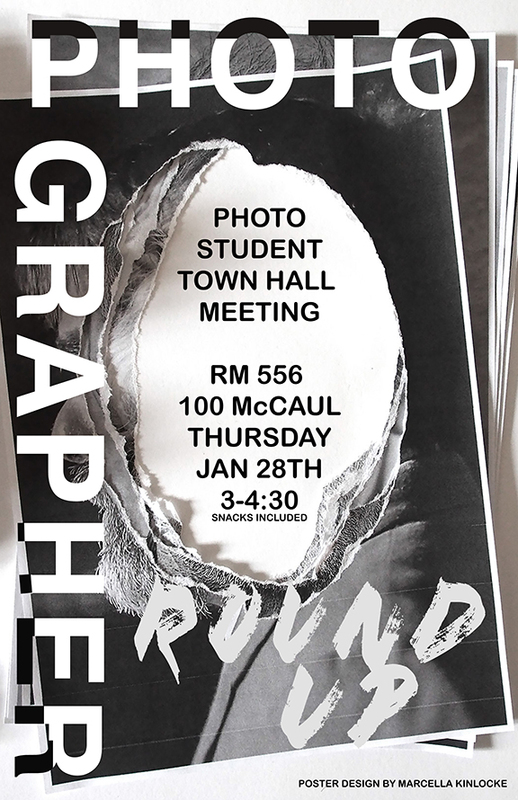 TODAY: Town Hall for Photo Students! January 28, 2016 / Jennifer Long / Comments Off on TODAY: Town Hall for Photo Students! Welcome back for another exciting semester at OCAD U! As you mark your calendar with assignment deadlines, exhibition openings, and work schedules, don’t forget to mark February 23, 5pm as the deadline to submit your work for posting on the Photography Program’s Instagram account! The concept for this account is to showcase the works of our students and department in an on-line portfolio. It will act as a tool to help promote our students outside the university while also representing the strength of our program. Deadline for the second round of submissions is February 23, 5pm. Sooner is better! 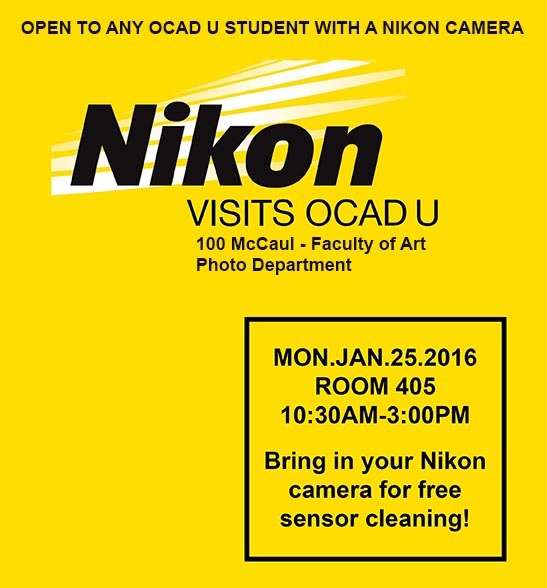 Jan 25: Free Nikon Camera Sensor cleaning! January 19, 2016 / Jennifer Long / Comments Off on Jan 25: Free Nikon Camera Sensor cleaning! Congratulations to 4th Year Photo major Madelyn Alexander for being included in the Student Union’s upcoming exhibition ART + DESIGN FOR SOCIAL JUSTICE! 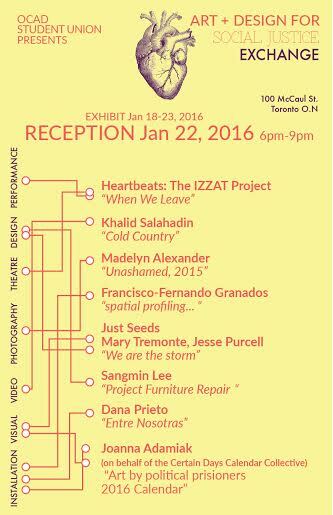 Mark your calendars for the opening reception at the Great Hall (100 McCaul st, 2nd floor) on Jan 22, 6-9! Bio: Maddie Alexander is a Canadian artist studying and working in Toronto. She began her education studying at NSCAD University in Halifax, Nova Scotia, and is now in her final year at OCAD University to graduate with a BFA in Photography. Her work explores multiple themes including the female bodies’ presence in our society and history, stigmas surrounding mental illness/health, and LGBPTTQQIIAA+ issues. Mainly through portraiture and combining image and text, she enjoys working experimentally by integrating both analog and digital practices.